Rotate this 3D model of the thyroid to see its location at the front and sides of the neck. The glands of the endocrine system secrete hormones into the bloodstream to maintain homeostasis and regulate metabolism. The hypothalamus and the pituitary gland are the command and control centers, directing hormones to other glands and throughout the body. Other primary endocrine glands, including the thyroid and parathyroid glands, the adrenal glands, and the pineal gland, adjust the levels of various substances in the blood and regulate metabolism, growth, the sleep cycle, and other processes. Organs such as the pancreas also secrete hormones as part of the endocrine system. Secondary endocrine organs include the gonads, kidneys, and thymus. The hypothalamus and the pituitary gland are part of the diencephalon region of the brain. The hypothalamus connects the nervous system to the endocrine system. It receives and processes signals from other brain regions and pathways and translates them into hormones, the chemical messengers of the endocrine system. These hormones flow to the pituitary gland, which is connected to the hypothalamus by the infundibulum. Some hypothalamic hormones are stored in the pituitary stores for later release; others spur it to secrete its own hormones. 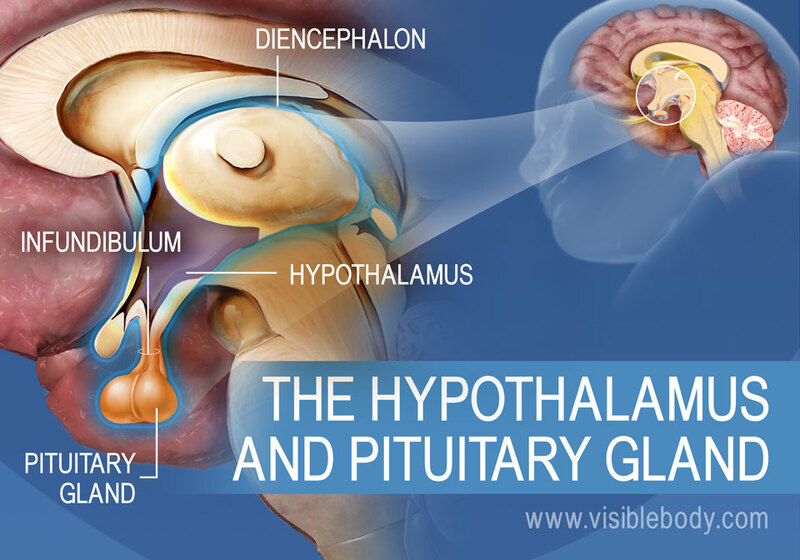 The hormones released by the pituitary gland and the hypothalamus control the other endocrine glands and regulate all major internal functions. 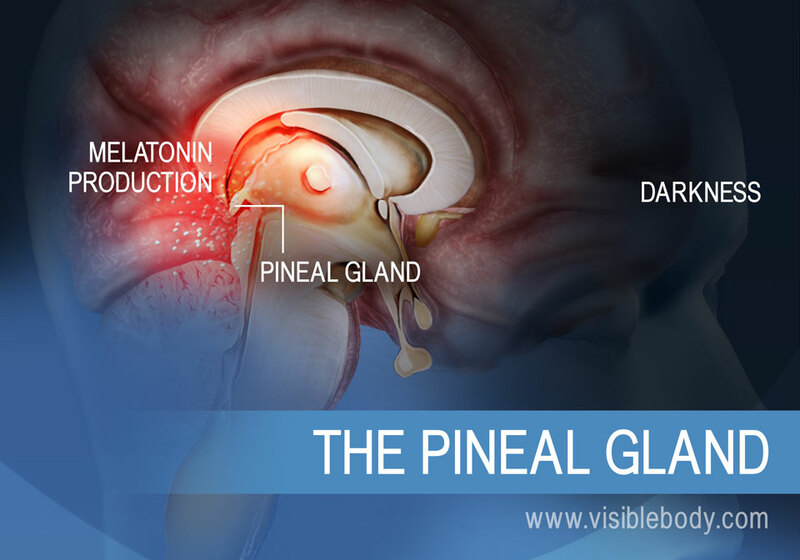 The pineal gland is small and pinecone-shaped, located at the posterior of the diencephalon region in the brain. As a seemingly unique, unpaired structure near the center of the brain, the pineal gland has been an object of historical fascination. The 17th-century French philosopher René Descartes thought it must be the “seat of the soul.” Perhaps the thought stemmed from the pineal gland’s role in sleep. At night, in the absence of light, the pineal gland secretes the hormone melatonin. Melatonin regulates the body’s sleep patterns in both circadian (daily) and seasonal patterns. In the morning, when light hits the eye, photo receptors in the retina send signals to the pineal gland, which then decreases melatonin production. The thyroid gland sits in the throat region, just below the larynx, served by large arteries with many branches and a dense network of capillaries. The thyroid hormones it secretes, thyroxine (T4) and triiodothyronine (T3), travel in the bloodstream throughout the body to increase metabolism, glucose use, protein synthesis, and nervous system development. The thyroid also releases calcitonin, which helps maintain blood calcium homeostasis by causing calcium to be removed from blood and deposited into bones when blood (calcium) levels are too high. On the posterior surface of the thyroid sit much smaller, separate glands: the parathyroids. 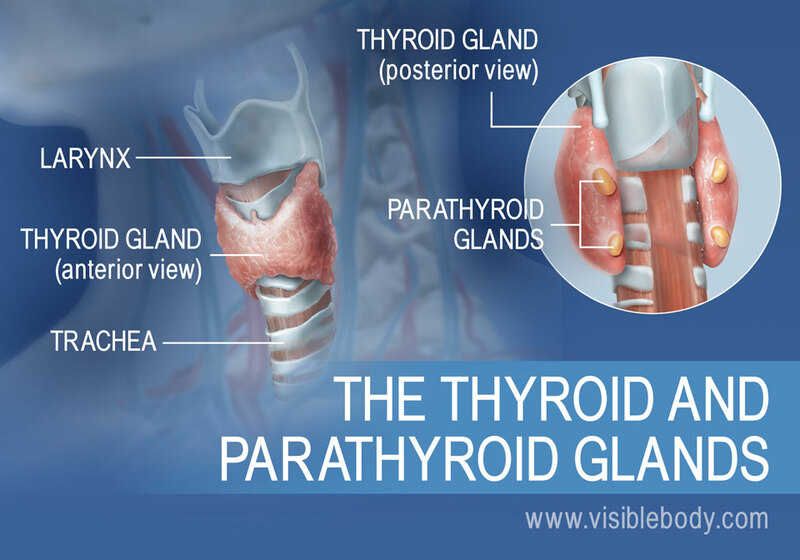 Typically there are four parathyroid glands, a superior and inferior pair on the left and right sides of the thyroid. They secrete parathyroid hormone (PTH or parathormone), which stimulates bones to release calcium into the blood when blood (calcium) levels are low. PTH also causes the kidneys to reduce calcium secretion into urine to further elevate calcium levels in the blood. Together, calcitonin and PTH act in complementary ways to maintain blood calcium homeostasis, which is one of the most tightly controlled physiological parameters in the body. 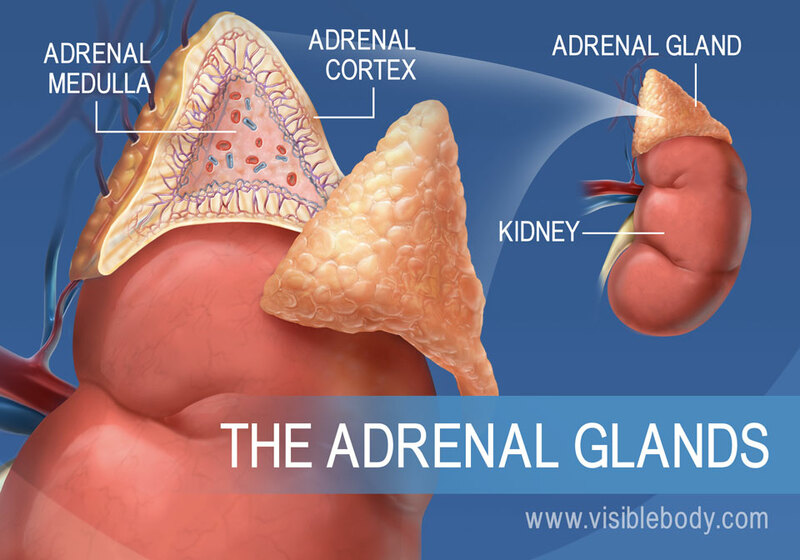 The adrenal glands are pyramid-shaped organs that sit at the top of each kidney. Each adrenal gland consists of two structures: an outer adrenal cortex and an inner adrenal medulla. The adrenal cortex is a network of fine connective tissues that makes up most of the gland. It secretes a range of steroid hormones. Glucocorticoids, such as cortisol, manage protein and glucose levels. Mineralocorticoids, including aldosterone, adjust levels of water and salt. Gonadocorticoids (androgens and estrogens) are secreted by the adrenal cortex in small amounts by both sexes. The adrenal medulla produces epinephrine and norepinephrine (NE). These chemicals promote “fight-or-flight,” the body’s initial response to stress. Some organs from other body systems also secrete hormones, and so are considered “secondary organs” of the endocrine system. The pancreas, for example, is part of the digestive system. It excretes pancreatic juice into the small intestine via the pancreatic duct. 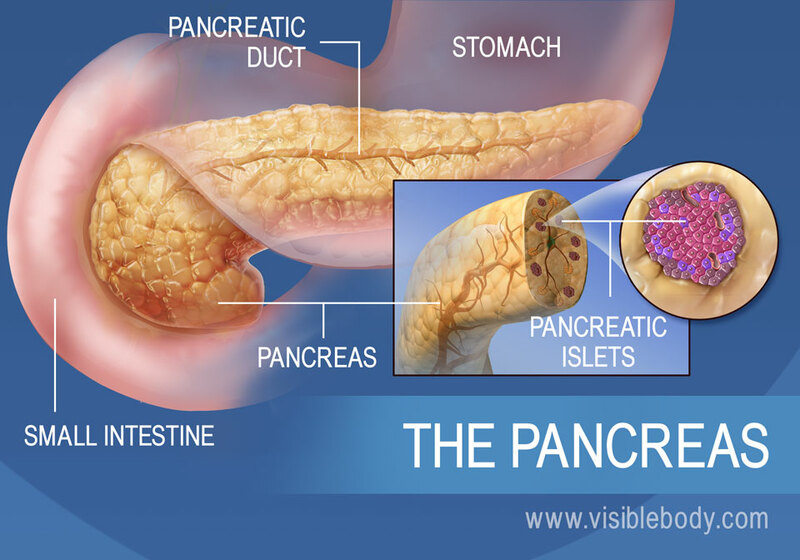 But scattered within the pancreas there are also tiny cell clusters called pancreatic islets (or islets of Langerhans) that release hormones into the bloodstream. These islets make up less than 2% of pancreatic tissue, but their specialized cells regulate blood glucose levels (or blood sugar). When blood sugar is low, alpha cells in the islets release glucagon. Glucagon spurs the liver to break down glycogen and release more glucose into the blood. When blood sugar is high, beta cells in the islets release insulin, which increases glucose reuptake. An article in Science Daily on a discovery about the structure of the pituitary gland. A description of the parathyroid gland from the 1918 edition of Gray’s Anatomy of the Human Body. 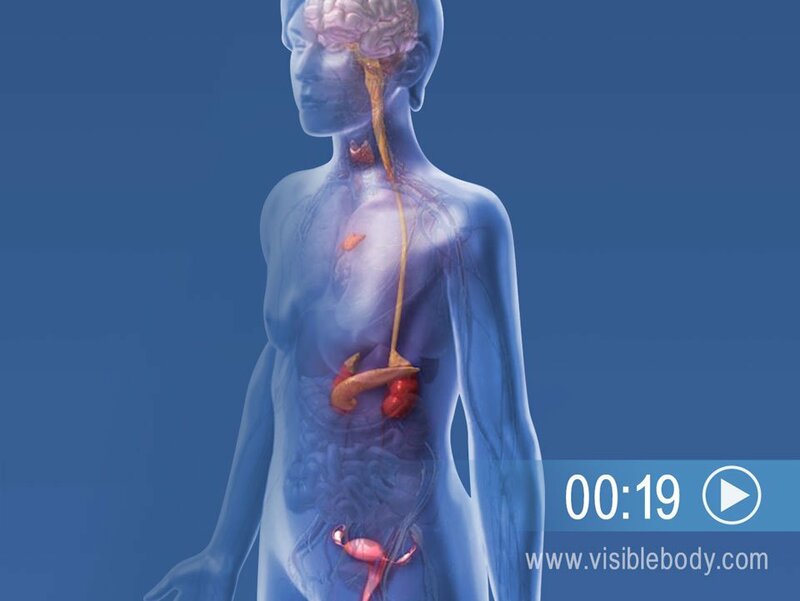 A resource for learning about the anatomy of the endocrine system from the the University of Chicago School of Medicine Online Library.